Social justice theory provides the lens for expanding out conception of student conduct administration, and the foundation for considering the systemic changes in practice and changes that are vital to address the concerns and issues raised by an increasingly diverse student population. Using this lens, this book casts new light on the existing principles and current practices; making issues of power, privilege and oppressive manifest; and offers a vision for expanding resolution practices to empower students of today to resolve their own conflicts. 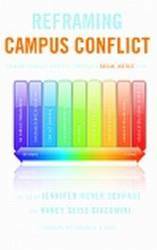 Complementing the Model Student Disciplinary Code, this book opens up a whole new range of approaches and models that readers can adapt to their institutional circumstances.